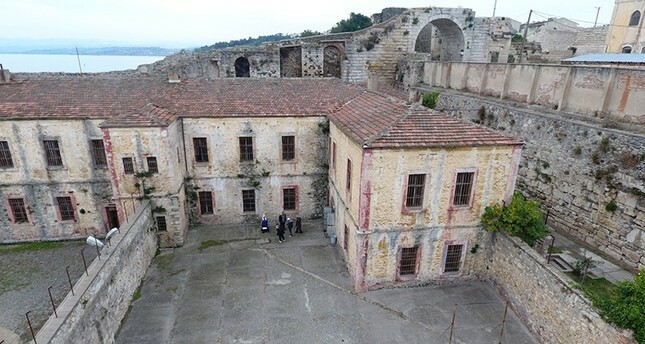 Known as the "Alcatraz of Anatolia," Turkey's historical Sinop Fortress Prison saw a surge of visitors in 2018, welcoming nearly 500,000 guests. The historical fortress, located on the Ince Burun isthmus jutting into the Black Sea, was built in the seventh century B.C. and used by the Persians, Kingdom of Pontus, Romans and Byzantines. It began being used as a dungeon in the 13th century after modifications by the Seljuk Turks. The giant structure with its 28 chambers and 11 watchtowers was converted into a prison by the Ottomans in 1887 and used by the Turkish Republic during the 20th century. In 1999, two years after the prison closed, the fortress was turned into a museum by the Ministry of Culture and Tourism. Sinop Provincial Culture and Tourism Director Hikmet Tosun said that officials estimate the number of visitors in 2018 to be 500,000. He said 300,000 tickets were sold to enter the prison, a number which doesn't include children, seniors and veterans who entered free of charge. The Ethnography Museum on the grounds is also free of charge, drawing an undetermined number of visitors, Tosun said. Muammer Köroğlu, a Sinop local, said the historical monuments and prison facilities are well-worth visiting. "I advise outside visitors and people from Sinop to visit the prison any time," he told Ihlas news agency. Sinop Fortress Prison was one of the most notable confinement centers of its day, and is known for having hosted prominent controversial Turkish figures and intellectuals during the 20th century, similar to the U.S.' Alcatraz Island fortress off the coast of California's San Francisco. Perhaps the most well-known inmate was Turkish novelist Sabahattin Ali, who wrote his works "Kuyucaklı Yusuf" and "Aldırma Gönül" while serving a sentence for writing poems critical of the founder of the Turkish Republic, Mustafa Kemal Atatürk. The prison also confined Turkish writers Refik Halit Karay, Ahmet Bedevi Kuran, Refi Cevat and Burhan Felek, and socialist political figure Hüseyin Hilmi. With its iconic stone walls and eerie intrigue, the prison has served as the set for media productions, including Turkish TV series Eşkıya Dünyaya Hükümdar Olmaz, Bizim Hikâye, Parmaklıklar Ardında, Esir Şehrin Gözyaşları and Tatar Ramazan, miniseries Köpek (2005) and comedy film Pardon (2005).